Currently subscriptions are �per year (�per couple) payable on 1st. September. Further details from the Society Treasurer, Tom Simpson 1 Berrywell Drive Duns to whom payment should be made. 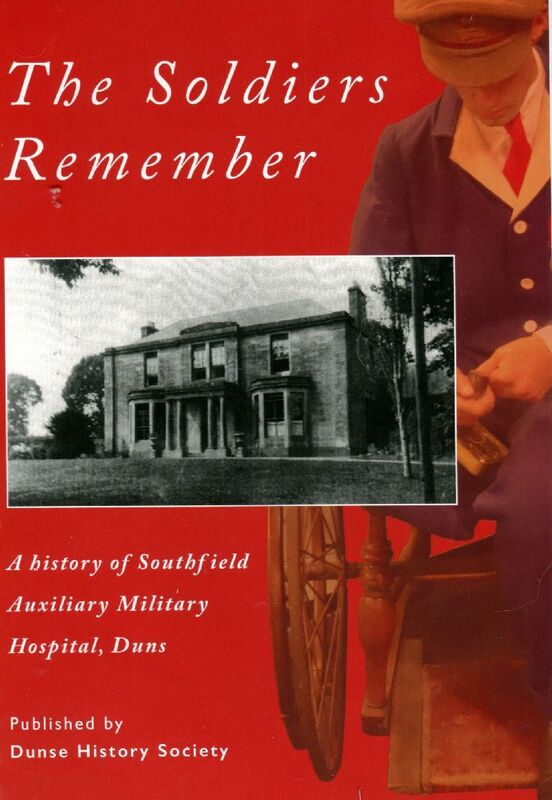 Between 1915 and 1919 Southfield Auxiliary Hospital was situated in what is now Southfield Community Centre, Station Road treating the war wounded from the First World War. Among the nurses who provided their services on a purely voluntary basis was one Margaret Mary Speedy (known as May) of Reedyloch Farm, Edrom. She was one of a family of three sisters none of whom married. There and while acting as a nurse and very probably of her own initiative she invited the injured soldiers to record their wartime experiences � (many of these were quite horrific recollecting life in the trenches, gassings and injuries sustained), how they saw life now and their hopes and aspirations for the future. If the soldiers preferred they were invited to write a piece of poetry, draw a cartoon or simply send a greeting. As such therefore an absolutely unique record. After the war the Speedy family moved to Edinburgh and these records with many others including such things as school report, exercise books, posters, newspaper cuttings and farm records were stored in two large boxes kept in a cupboard under the stairs. In the 1970s, the sisters all having died, the house was purchased by Judy Murray and her husband who came across the papers quite by chance. Recognising their potential value they decided to keep rather than destroy and in course were taken with them in four subsequent removals. During this time they had historians and others look at them and assess before in 2016 deciding to donate them to Currie History Society who in turn, recognising their local significance passed them on to ourselves. Appreciating their absolute uniqueness we decided to publish and our gratitude to Blackhill Windfarm Community Fund for a grant towards the costs to enable us to do so. The original records of the Hospital (as indeed of approximately 98% of all Auxiliary Hospitals) have been lost. However we have managed to ascertain that during the period of its existence 960 patients were treated. As it so happens the local newspapers on an approximately bi-monthly basis gave the name rank and regiment of the soldiers being treated. Going through these records we have managed to get details of 678 of these and this information is included in the book. The local populace was also encouraged to make donations to the soldiers, usually food but also such things as cigarettes, books magazines and even tennis balls. These gifts too were recorded in the local newspapers and have also been extracted and detailed. Also include in the book are diary entries from the War years and various relevant newspaper cuttings and extracts. This C.D. produced by Borders Family History Society contains a transcription and also photographs of all the stones (341) in Duns Parish Churchyards and also in Christ Church Churchyard, (141 stones). The C.D. which is fully indexed also includes a history of the Church, details of all Duns Church ministers, a transcript of the Hearth Tax and the Militia List and also of the War Memorial and various Rolls of Honour. For fuller details including a list of all the surnames appearing on the stones click here. The purchase price is �plus postage. 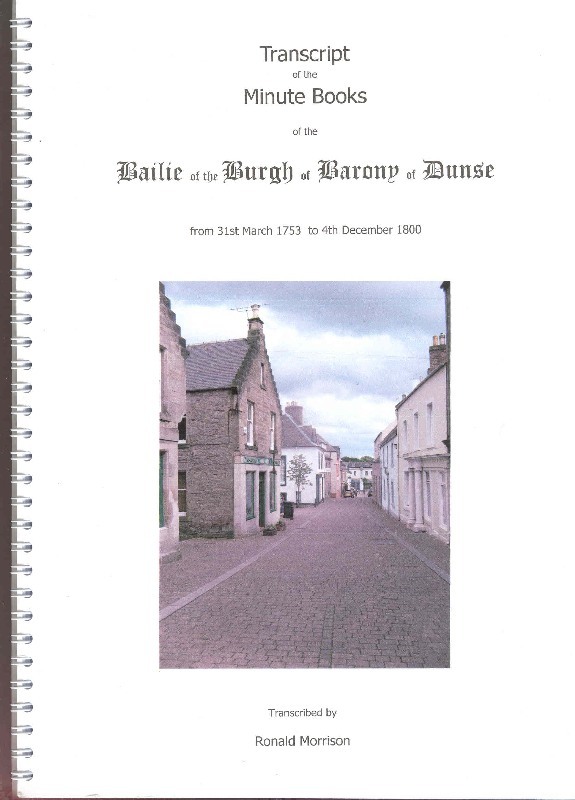 This book is a transcript of the determinations of the Baron Baillie of Dunse between the years 1753 to 1800. Dunse had been granted a Charter of Burgh of Barony by James 1V in 1490 allowing the Baron Baillie to appoint burgesses for the day to day running of the Burgh, to afford protection of the different trades within the Burgh, to make regulations regarding commercial activities such as the size, content and price of a loaf of bread, to make regulations regarding such things as the removal of dung from the streets and early building regulations; also limited judicial authority both civil and criminal dealing with such matters as debt recovery and bankruptcies and on the criminal side comparatively minor offences such as " Boistering with tarsticks" and "entertaining of sturdy beggars". No fewer than 340 individuals are mentioned and the book is a useful source of reference from a family history point of view and also an interesting insight into the governance of an eighteenth century Scottish burgh. Wire bound price �00 plus postage. This is a transcript of the Diary kept by the Rev. John Hastie starting in approximately the year 1790 and covering the period from 1797 until his death in 1822 when he was Minister of the Parish Church of Edrom. 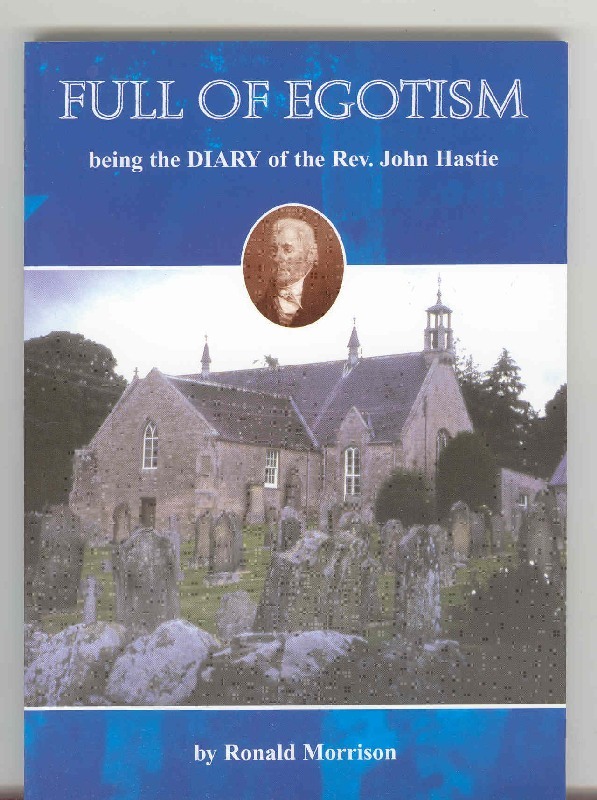 The book gives a fascinating insight into the life of a minister in the Scottish Borders at the turn of the nineteenth century, his thoughts and concerns as well as an appreciation of the virtues and failings of a very likeable and personable individual - not at all the dour censorious Calvinistic preacher of the period we are perhaps apt to imagine. The book has been fully indexed and there is a separate section showing references to christenings, marriages and deaths officiated by or known to the diarist, events in some cases of which there is probably no other record. A5 116 pages price �50 plus postage. The Society was pleased to have assisted in the recent launch in Duns Library of the above book written by Bill Watson and published posthumously by Coleshill Auxiliary Research. Coleshill Auxiliary Research is an organization dedicated to recording the history and preserving the memory of British Resistance Units set up by Churchill during the last War as a last line of defence in the event of a German invasion. 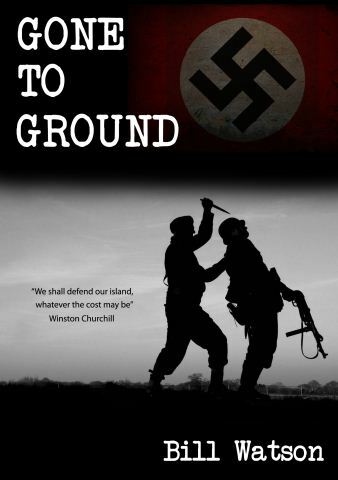 The book, a work of fiction based on Duns and from which real persons might possibly be identified, is set in 1940 and the following years and presupposes a German invasion of these Islands with an airborne invasion force landing at Charterhall and using this as a base for the occupation of the whole of the country. The author was a member of one of these top secret units and the book envisages what might have happened - a tale of resistance, heroism, and heartache and, the historical and local interest apart, a very riveting read. The book was officially launched by Mr. David Blair, the Scottish Information Officer, before a capacity audience. Also contributing were Lady McEwen of Marchmont, various members of the Society and others. Present also, thanks to research done by members of the Society and also by Borders Family History Society were a number of relatives of other members of the cell and what seemed to emerge was just was how little relatives knew even of its existence. Further details of the book and the patrol including photographs of the book launch, of the author and of the operational base can be seen on the Colshill website. Bill Watson was born in Edinburgh in 1924 but spent his early years in Duns and attended Duns Primary and Berwickshire Secondary School. After leaving school he was apprenticed as a local joiner before joining the Scots Guards and serving in the Middle East and Italy. He was captured in1943 and spent the remainder of the war as a German prisoner. The price of the book to purchase is �50. It can also be downloaded as an ebook on Kindle for �58. To order and for further information.